Elysium Planitia is the second largest volcanic region on Mars. It is located on a broad dome that is 1,700 by 2,400 kilometers (1,060 by 1,490 miles) in size. The volcanoes Hecates Tholus, Elysium Mons and Albor Tholus can be seen going from north to south (top to bottom) in this image. Hectas Tholus is 160 by 175 kilometers (100 by 109 miles) in size with a caldera complex 11.3 by 9.1 kilometers (7 by 5.7 miles) in size. Elysium Mons is the largest volcano in this region. It has base dimensions of 420 by 500 by 700 kilometers (260 by 310 by 435 miles) and rises 13 kilometers (8 miles) above the surrounding plains. Its summit caldera is about 14.1 kilometers (8.8 miles) in diameter. 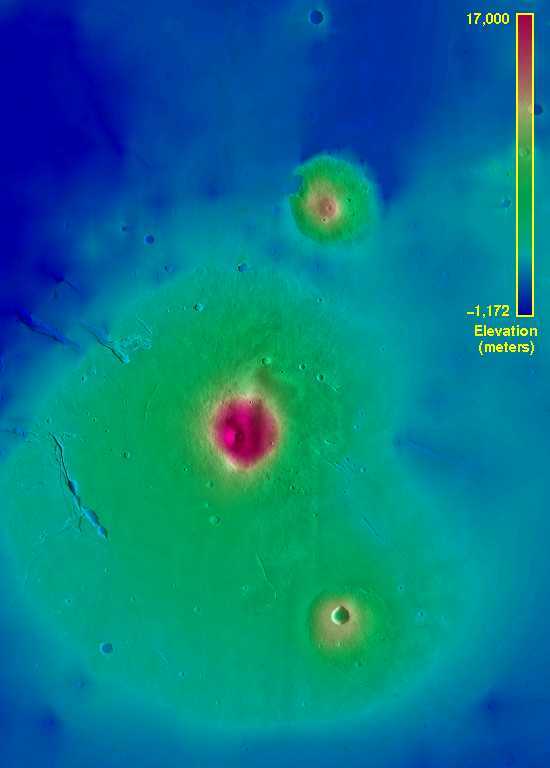 Albor Tholus measures 160 by 150 kilometers (100 by 93 miles) with a summit caldera of 35 by 30 kilometers (22 by 19 miles). Its northwest flanks have been partially buried by lava flows from Elysium Mons.